How Much is Enough Water? | Starkie Bros. The easiest and most common method of watering is to apply enough water to the soil surface so that some water drains from the bottom of the pot. Then, "feel" the soil to determine when to water. There are various types of water as well. Water safe for human consumption is usually safe for plants. Softened water usually contains sodium, which can break down soil structure. Hard water contains calcium and magnesium that helps build soil structure. Chlorinated drinking water can be used on plants with no detrimental effects. However, chlorinated water found in swimming pools usually has too high of a concentration of chlorine for plant usage. Fluoride and boron are also found in some water and they can cause plant cell damage. 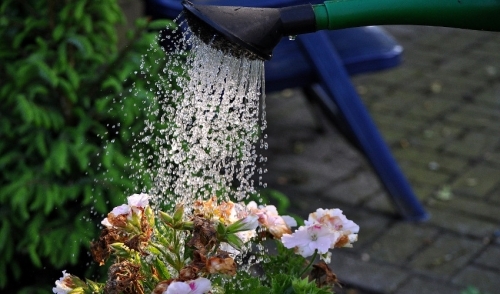 Water sparingly: Give enough water at each watering to barely moisten the potting mixture throughout. Water in several stages adding a little water each time. Water moderately: Water so that the mixture is moist all the way through. Allow the top 1/4-In. to dry out between applications. Water plentifully: Keep the potting mixture moist and do not let the surface of the mixture dry out. Leaching: A process to wash excess fertilizer salts from the soil. Underwatering: This is most damaging to plants in low humidity conditions. Symptoms include; the entire plant wilts, leaves curl and droop, edges and tips of leaves turn brown, green leaves drop, roots are brown and dry. To avoid underwatering, water more thoroughly and more often. Overwatering: Overwatering fills the needed oxygen spaces in soil. Use a well-drained soil mixture and do not allow plants to stand in water. Overwatering symptoms include; the whole plant wilts, the lower leaves turn yellow and drop, new foliage has brown spots, the whole plant is stunted, stems and roots become brown and decayed. Plants that are from wet environments. Plants which are succulent in nature.